A stable. A natural birth. Shepherds. Animals. Tired travelers. It wasn’t fancy. It wasn’t grand. The only thing majestic about it was the identity of the child. It was simple. I posted on Instagram last week about the fact that my theme for Christmas decor this year is simplicity. Since posting that, I have seen that theme echoed all over social media (even Young House Love Has a Podcast talked about it in this week’s episode!) Either it’s just the trend this year to make things simpler, or people are tired of complicated and desperate for peace. I have a feeling the latter may be informing the former. When we moved into our new home, everything we owned got piled into the basement while we worked on renovating the main floor. 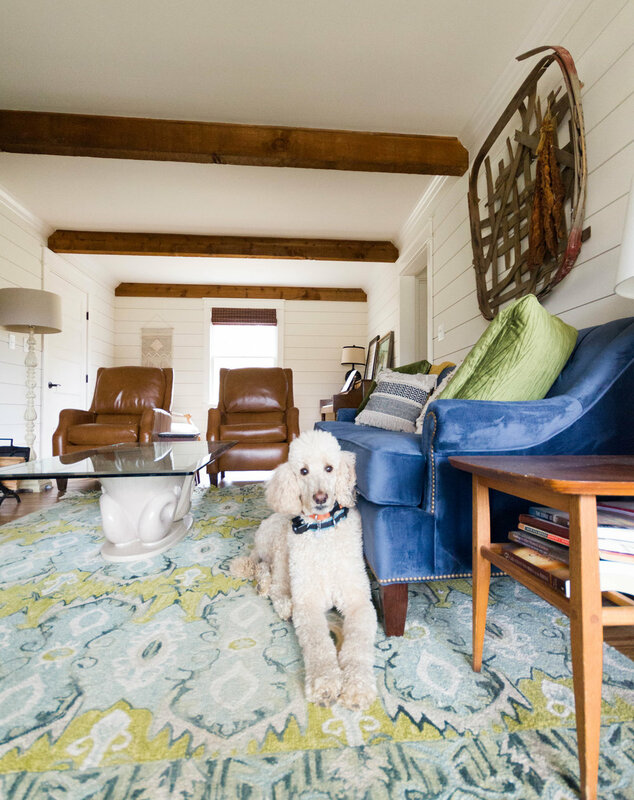 Once that Reno was done, we only moved the things upstairs which we actually needed or wanted, and all the extraneous stuff was left in piles in the basement (it’s chaos down there). Moving things in that way taught me a valuable lesson: we don’t need as much stuff as we thought we did. In fact, we don’t even WANT as much stuff as we thought we did. As a lover of home decor and decorating, I have a tendency to collect and hoard pretty things. I love a good find. But the truth is, I don’t need ALL the pretty things. It’s ok to leave space for things to breathe. 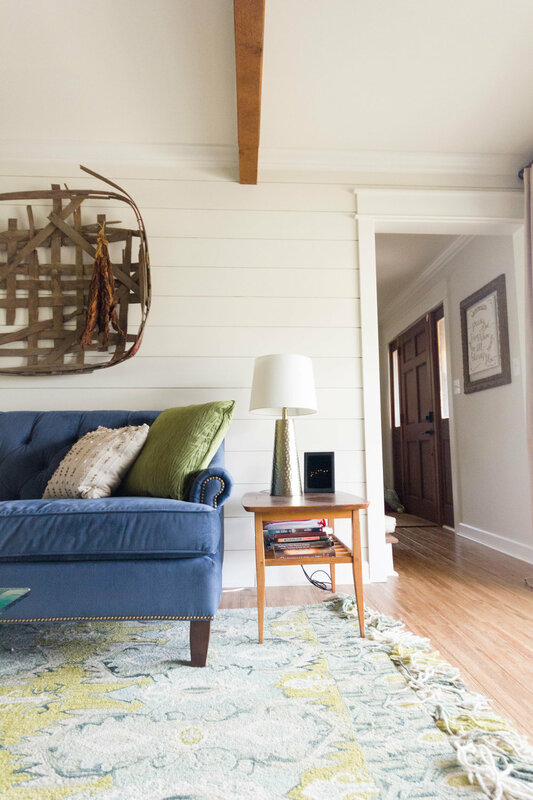 When my house has blank space and is de-cluttered, I find that it gives my mind the freedom to de-clutter a little as well. When Christmas comes around, we pull out boxes of EXTRA stuff to add to our already cluttered homes. It’s beautiful and sentimental, yes, but this year I just wasn’t in the mood. I wanted simple. I wanted space to breathe. So I left several bins of holiday knick-knacks in storage and only pulled out a few choice things. I cleared our dining room shelves of everything that was already there to make room for some decorative miniature trees. I used fresh greenery and wreaths to adorn the table and doors. Our skinny tree that was perfect in our old house feels too small here, but I decided that it simply wasn’t a financial priority to buy something new. And the NOT buying felt so good. My prayer this Christmas is that I keep things simple. That I allow my heart to celebrate the coming Messiah rather than just the pomp and circumstance of holiday tradition. Will I still watch cheesy Hallmark movies and listen to Bing Crosby while I drink hot chocolate? Absolutely. But my hope is that my heart makes room for Jesus above all else. 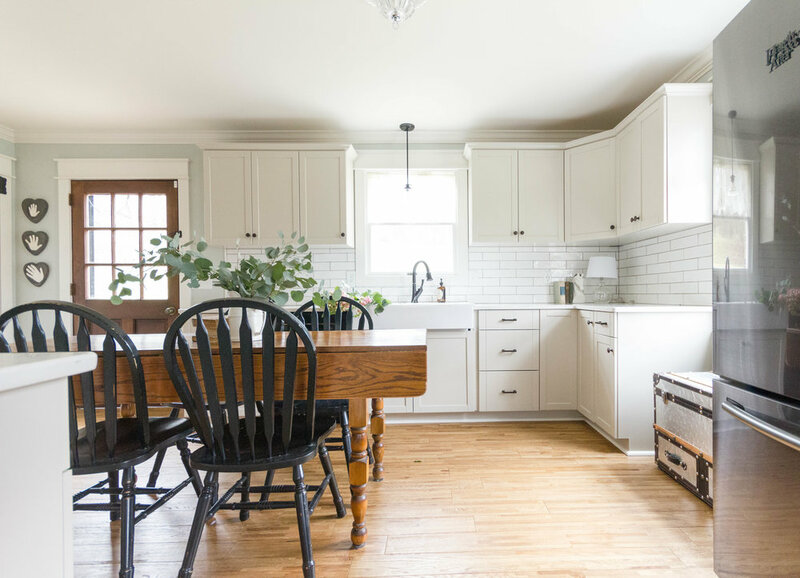 If you have yet to see our kitchen reveal post, you may want to hop over there first and check out all the details of our newly renovated kitchen! We used IKEA cabinets with doors and drawers from Semihandmade, and today I wanted to share my honest review of our cabinets now that we have lived with them for three months! For those of you not familiar with Semihandmade, they are a California-based company that makes doors and drawer fronts specifically for IKEA cabinets. 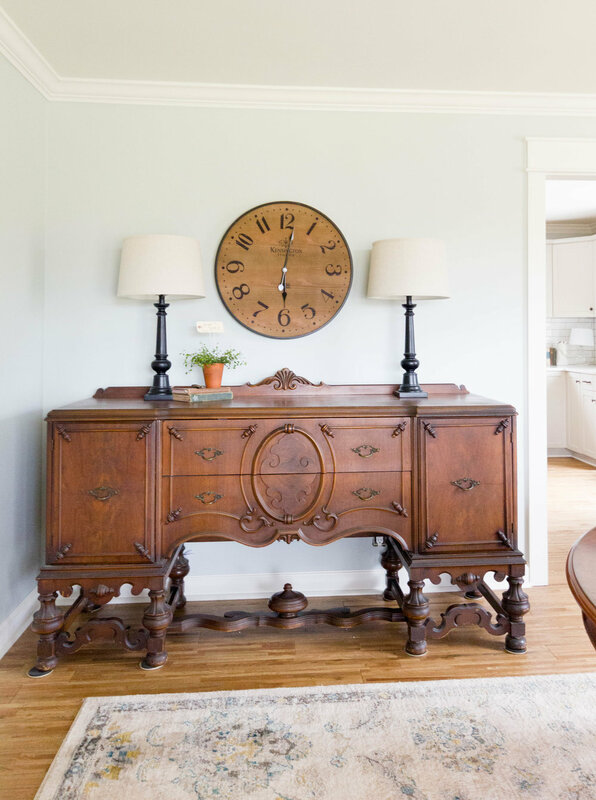 When I learned about this option, I was thrilled because it meant we could get exactly the color cabinets we wanted, and the idea of real wood doors keeps the cabinets from looking like generic IKEA cabinetry. The entire cost of our cabinets was $4700 (including paint). We caught both IKEA and Semihandmade during sales, but even without the sales, the price would have been hard to beat. We started out by designing our kitchen on IKEA’s home planner. We were starting from scratch with our kitchen, so all we had was rough measurements and the placement of the sink and window. We experimented with lots of cabinet options and layouts, and this is what we landed on. One difficulty with our layout is that because IKEA cabinets are only available in certain widths, we couldn’t make it exact, and we knew we would have to fill some gaps with filler pieces. Also, my island concept isn’t something we could purchase, so we planned on adding table legs to the existing island cabinets in order to create the island we envisioned. After finishing our IKEA plans, we sent the renderings to Semihandmade. 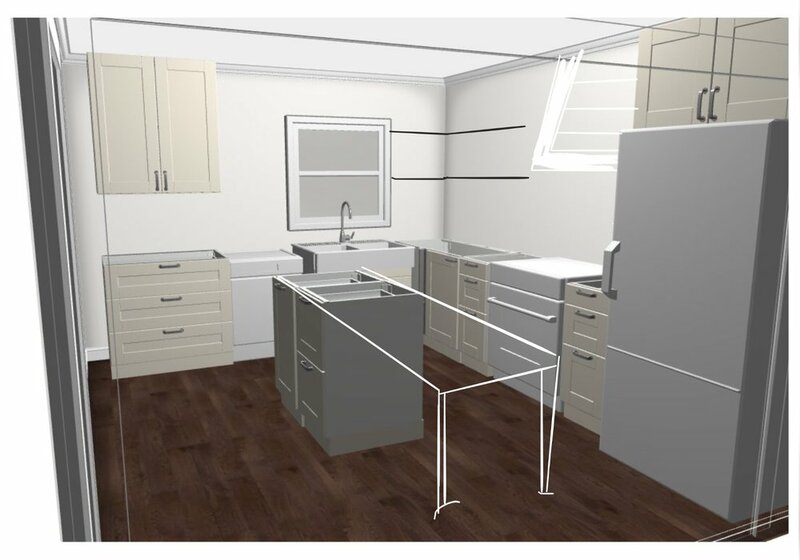 Because they are so familiar with IKEA cabinets, they were able to take our renderings and send us an exact breakdown of everything we would need to order from them as well as everything we would need to purchase from IKEA. Because our closest IKEA is 3 hours away, it was very helpful to have a list so we knew that we would get everything we needed! We chose the DIY Shaker style from Semihandmade, and they fulfilled our order to our exact specifications. The doors were all delivered on a pallet to our driveway. We started our kitchen installation by installing all of the IKEA boxes while we painted the doors, drawer fronts, and filler pieces. Because the rest of the house was still under construction, we made a little painting station in the guest room and went to town spraying and rolling them (see this post for my recommendations on painting cabinets from our last kitchen). The semihandmade doors and drawers install exactly like those from IKEA, so we simply followed the standard installation instructions which were made easier by instructions provided from Semihandmade as well. After everything was painted and cured, it was time to install! I knew we had to have a narrow island based on the size of our kitchen, but I still wanted the space for barstools, so this island design worked out perfectly! Jeremy bought two stair banisters at Home Depot and cut them to size to use as the island legs and then filled in the space between with 2x4s. 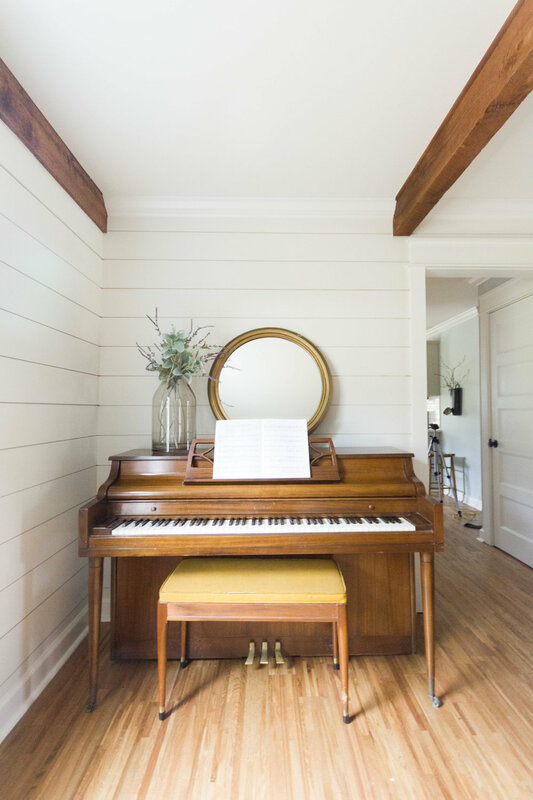 I love the sleek style of the shaker style doors. They fit the style of our kitchen perfectly. I really love the functionality of having mostly drawers. The only standard cabinets we have are the upper cabinet and sink cabinet. Everything else is drawers, and they have made storage and organization so much better! If you have the option to choose drawers over doors, do it! One of my favorite IKEA functions is the option of the hidden drawer. Three of our drawers have a secondary hidden drawer inside which makes for even more storage and organization. We even started storing all of our plates and bowls in a drawer instead of upper cabinet. And IKEA cabinets come standard with soft close which makes me feel like I’m living in luxury. There are a few things I would do differently if I were to start over on this kitchen, but they are very minor. My main piece of advice would be to check and double check your measurements before designing your kitchen and choosing cabinet sizes. I ended up with much bigger filler pieces than was necessary because I thought I had less space than I did. It turns out I could have used two 18” cabinets next to our stove rather than two 15” cabinets. It’s such a minor thing, but I do wish I had been a little more careful with my measurements because I would have had a hair more storage and a hair less filler space. If you choose to go the IKEA+Semihandmade route, be prepared that there is quite a bit of DIY work involved in the process, but I think it’s absolutely worth it! The results are beautiful, and Semihandmade is wonderful to work with. They will help you every step of the process! Hey all, Jeremy here. I just finished hanging shelf brackets on our tile backsplash in the kitchen, and I thought I'd share the process! Hope this is helpful for any of you DIYers out there looking to spruce up your tiled wall space! Let me begin by saying this - after spending the better part of 3 days putting up the tile backsplash, I was a little apprehensive to take the drill to my hard work. After all, it's not like if you make a mistake you can just patch it up...it's kind of a one-and-done deal. So that being said, just know that the process isn't that complicated. Move forward with confidence and remember the phrase my dad always said - "measure twice, cut (or drill) once." Measure out where you want your bracket to be and use painters tape to tape this spot. The painters tape helps the tile not crack while drilling (very important). 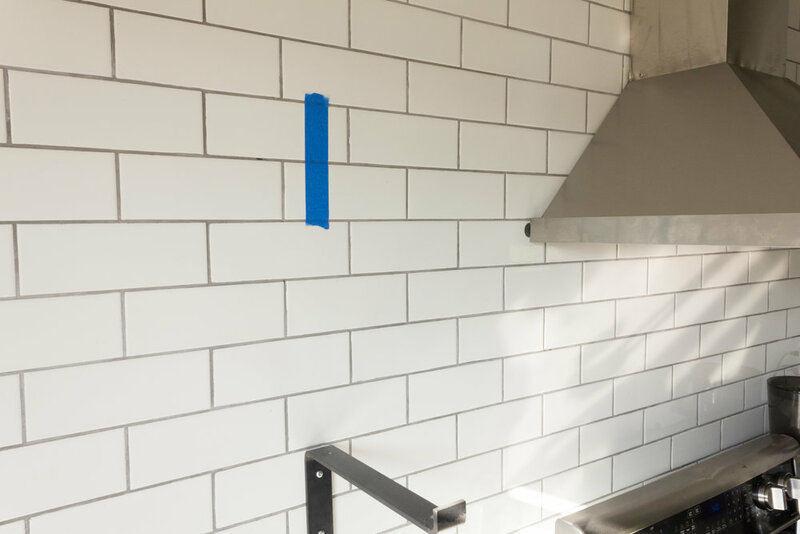 It is also a good idea to mark your center line all the way down this blue tape - this ensures that you are hanging your bracket level vertically. Place your bracket over the tape, lining up the center of the holes in the bracket with the center line you drew on the blue tape. Make sure the height of the bracket is where you want it. Once you like where you have the bracket, use a sharpie to mark where you want to drill your holes. Make sure that you check the packaging of your drill bit to ensure that the particular bit can be used on your particular tile material. Some bits are glass/porcelain, others cannot be used on porcelain. Just be sure you're using the right bit. 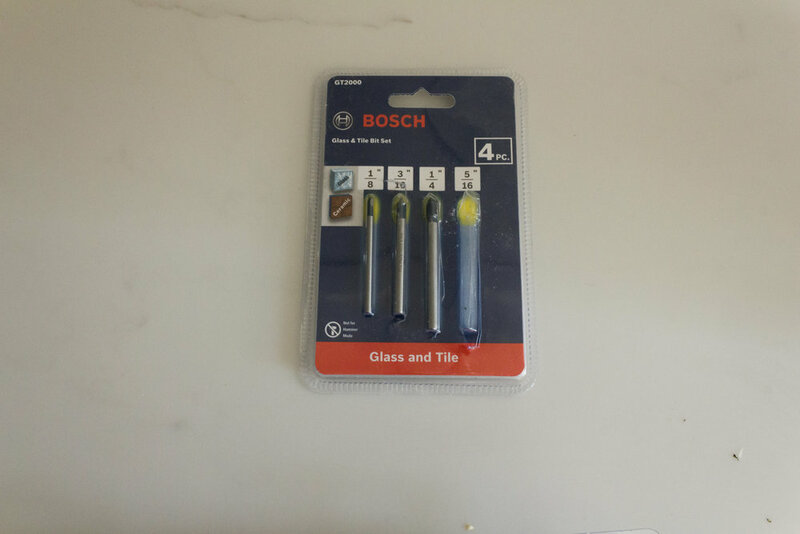 I bought this Bosch kit of tile bits and they worked great! I used the 5/16" size. Now it's time to start drilling. If you don't read anything else in this post carefully, read this - TAKE THE DRILLING VERY SLOWLY. Apply consistent pressure and drill at a low speed. The bit will catch and begin scraping away at tile. Taking this slowly will make a perfectly round and smooth hole in your tile, which is what you're shooting for. Once you're done drilling you can take the tape off. Time to put the anchors in. It's a pretty simple process - push the anchors in, hammer them flush. Be very careful while hammering - you definitely don't want to miss the anchor or hit the tile in any way. Just tap it in lightly. I used the Cobra Triple Grip anchors, and they did pretty well. Caveat 1 - the 5/16" tile bit was a little tight to fit these wall anchors. 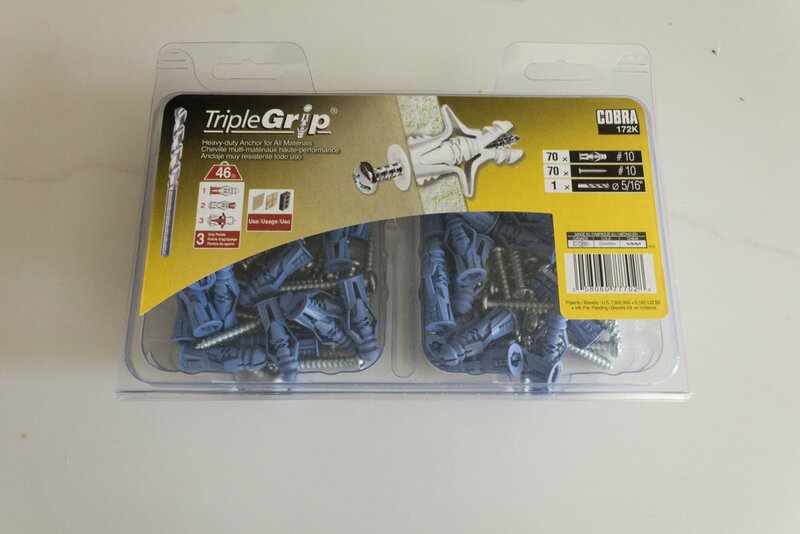 Luckily, the Cobra Triple Grip anchors come with a masonry bit. I very carefully used the masonry bit to open the holes up ever so slightly. It isn't as clean as the tile bit, but it opened it up just enough to get the anchors in. Caveat 2 - the anchors themselves are a little 'squaty,' but you can squeeze them to straighten them up. You'll need to do this for them to fit into the tile. Don't try to force the anchor in or it will bend. You're in the home stretch! Simply put your bracket up and screw it in. Voila! Wipe your hands and pop the champagne. Although intimidating at first, this process really was pretty simple. As long as you are very careful and take your time, this project shouldn't cause you any heartache. In fact, in a pretty short amount of time you can really give your tile wall great facelift. I hope this is helpful...comment with questions or other tips you've found!